Briefly in english | Rintanappi.fi - Rintanapit omalla kuvalla kotimaiselta valmistajalta! We are delighted that you found your way to us. We offer premium custom pinback buttons, the perfect product for your event's, promotion's or fundraiser's needs. Pinback buttons, campaign buttons, badges, call them what you want, are great for bands, political campaigns, charities, schools, wedding favors, advertising, sports teams and much more! Even a small budget will give you a lot of visibility! All our pinback buttons are made of durable steel parts. The image is printed on high-quality paper for bright print clarity and a wide color gamut for vibrant and clear colors. The pinback button has a glossy mylar-topped surface to protect the design and to ensure the button to last for a long time! Our buttons are round, with a steel pin-back, and come in four different sizes. Some sizes can also be made as refridgerator magnets, pocket mirrors or bottle openers. 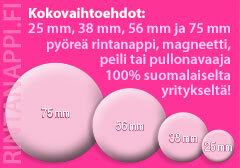 We are especially proud of the fact that we manufacture your custom buttons in our facility located in Olari, Espoo. You can be assured that we are sweatshop free! The price depends on how many buttons you order, and in what size. The more you order, the lower the price per product will be. You'll find our prices over here (click). We offer four different sizes of buttons, with different backs. Background options for different sizes. You can choose from different background options. How many buttons do you need? The minimum order quantity is 50 pieces per design. What do you want on your button? You can send us your design in almost any image format (.jpg, .tif, .psd etc.) or as vector graphic (.pdf, .ai, .indd etc). We can also do the design for you if you don't have it ready. Easy things, such as adding text to an image, are free of charge. More complicated things are done on a hourly rate. Please ask us for a quote. Please remember to fill the bleed areas. When do you need your buttons? We offer fast turnaround when needed to meet your tight deadlines. There is no handling fee if you come and pick up the products by yourself. For the postal parcels you only pay the regular postal fee. You can see the current prices at www.posti.fi. Tell us both Your contact information and your billing address; the name, address and in a case of a company the VAT identification number of the party being billed. If you have an electronic billing address, include this also. Our manufacturing premise is not a shop and we do not have a cash register, therefore we always bill. • Private customer - we charge beforehand. • Company - we can acquire a credit decision. In order to acquire a credit decision one must have a clean credit history. In this case we bill small or normal sized orders with a 14 -day credit. In case of a bigger order we require half of the payment in advance and the rest upon delivery. We will send you an order confirmation with a digital proof of your buttons. We do this to make sure your order comes out perfect and just the way you want it! If you have any other questions regarding your order, don't hesitate to email or give us a call. We are open on weekdays from 10 AM to 6 PM. Address: Kuunkehrä 2, 02210 Espoo (Olari). Finland. Map with parking spaces seen here. Please remeber that this is our manufacturing premise, not a shop. We kindly ask you to book an appointment with us in advance if you like to come and visit us!